That is insane. Did you write that? Can't claim credit. I'm quoting it from a long forgotten source. I agree, whoever wrote this jumps high on my list of favs. Never heard pi presented in such a passionate tone. that's crazy. 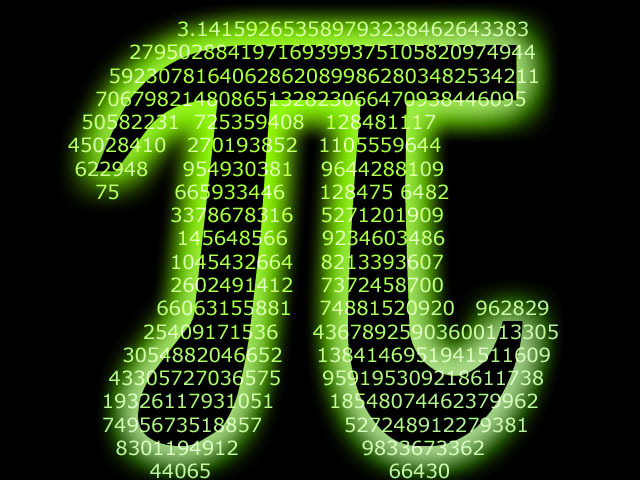 pi is a wondrous thing, i never thought of it in words!!! Sorry.. but could someone please explain to me how this makes pi? Take the number of letters in each word in the poem. Place a dot after the first number. Ta-da!! the answer "pi" from all this jive? obviously this was produced in Europe (not UK) cos the decimal place holder is a not a point but a comma instead. iteresting...heres one:every names a touchstone that leads to a place and time where god has used another soul to reach out and touch mine.it may have been years ago or even yesterday,but every person on my list has changed my life some way.through simple conservation or even a shared meal,every person on my list has helped me grow or heal,or laugh,or love,or learn,or smile,my friends have known me throughout these miles.the blessing never ends as god allows our path to cross as family and friends.so please know that this is more than a new year wish,it is a thank you page for putting them on my list.each and every name i've come to hold so dear,from those who show our god our joy,each day we live with no fear. now beat that!!!! zirionian laughs!!hahahaha! hahahaha! is this from something like poe e raven or something because that includes a ton of pi's didgets! wow. i think im in a forum with loads of adults or at least upper-high school kids... im 11. is that actually pi? urmm... 3.14159265358979323846...? kl "the pi poem". The next number is 0 so unfortunatelly it can't go much further. Is the problem's very centre. Of number small, yet unmet finitude. She doggedly aims absent of parity. When I saw this I was like "This isn't ri... Oh my God"
I won't say my last name but I promise it met the conditions.